or, Gwyn Donates A Computer To A Museum. Since Yvonne’s mother Betty moved house in December and died in January, I have been introduced to the benefits of Decluttering. I am not in any sense a hoarder; I just don’t throw things away. Betty was ruthless. Anything that seemed ‘old’ or ‘worn’ was unceremoniously dumped. There was no room for sentiment. She was horrified at the things I kept. 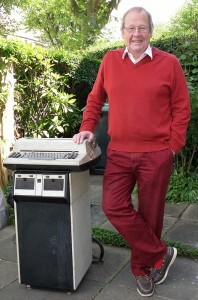 When we moved into Mount View Road 30 years ago, I brought with me a Redactron, the first computer I ever bought. I last switched it off in 1984, at which time it was in perfect working order. We needed three men to manoeuvre it into the basement, where it has been sitting unused and undisturbed these past three decades. I used to own a book and theatre publicity company called Headley Plachta Rolfe. I bought the Redactron second-hand in 1979 from the Prudential Insurance Company for £5,000, 7% of the purchase price of our house; the equivalent today of about £100,000 — as a percentage of the house price, of course, to show how artificial the housing market has become. Book publicity in those days consisted of phone calls, mailings, letters, drinks and lunches. Mainly drinks and lunches. We kept our own jealously guarded records of journalist contact details. List brokers barely existed and their data was laughably inaccurate. The Redactron helped us store all the data we needed on our journalists, which was basically one address, one phone number. These were the days before even faxes. We would write standardised boilerplate letters, flavoured with a few personal touches to make them seem individual. As we already knew almost all the journalists by meeting with them and speaking to them on the phone, the Redactron helped us add simple personal touches. Fancy a drink, George? The cable connecting the CPU box to the printer was thicker than my forearm. The printer was an IBM golfball, and as I was originally a typographer I acquired all the different font balls, although only one has survived. We were based in Fitzroy Square at the time, in a Grade I listed building. When we turned the Redactron on, lights would be dimmed across Fitzrovia. When we ran it, conversation ceased and flakes of plaster would drift down from the ceiling. The room thrummed. We purchased earplugs in bulk. Recipients got what was to all intents and purposes a hand-typed personal letter. It was an age when it would have been rude not to respond. We were sending out 300 of these a day with the aid of the Redactron. Our competitors could barely manage thirty. We did very well for a while. Certainly well enough to recoup the money shelled out for the Redactron several times over. And now it’s time to say goodbye to my old friend. Some years ago I wrote this blog about the Redactron, after I discovered the machine had been invented by a remarkable women named Evelyn Berezin. And a few years later Evelyn Berezin herself spotted the blog. Still later she suggested that as apparently it is the last Redactron in existence, I might like to donate it to the American Computer History Museum in Mountain View, California. “As long as they come and pick it up,” I insisted. I’m not risking my sacroiliac again. Having just read A Feathered River Across The Sky, the tragic tale of how Americans extinguished the Passenger Pigeon, I thought I’d give them something of their own to preserve. Our original intention was to turn the basement into a kitchen, but the Redactron took up too much space. Perhaps at last we can go ahead. Here it is, dusty as nature intended, at the start of its journey from Mount View to Mountain View. Good luck, old pal! The museum specified that we must not clean it up before despatching it, it’s not that we’re sluttish or anything. As well as decluttering, we are Defiling as well. You may think you knew what ‘defile’ meant. With ten filing cabinets to clear out, we’re busy creating a new meaning for the word. To my emailing friend who suggested I meant ‘exterminated’ when I wrote ‘extinguished’ in the line ‘Having just read A Feathered River Across The Sky, the tragic tale of how Americans extinguished the Passenger Pigeon …’ the answer is yes, ‘exterminated’ would have conveyed half the sense I implied. I chose ‘extinguished’ deliberately because the great light of the passenger pigeon has been put out by its extinction, just as the birds themselves in their prodigious flocks blotted out the light of the sun for hours on end. Delighted, ma’am. How’s the swimmimg? I´m a computer collector and i was given a complete Redactron systems like yours from a closing office. Formerly it was sold to Switzerland and in the 90s it moved with the office to Germany. So i got it including a large 2-place Siemens wordprocessing system from 1982 an i needed a small truck tro move them to my house. I inspected the system and found only a small amount of faulty electrolyte condensators – that, after more than 40 years is s sign of high quality. Hope it will work again in a few day days! Is there any chance to reach Evelyn Berezin to thank her for her work?